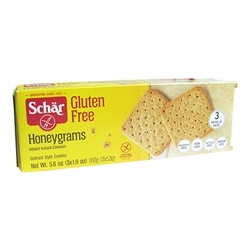 These delicious gluten free Honeygrams are perfect for you next campfire snack -- S'mores! Ingredients: corn starch, brown sugar, corn flour, palm oil, soy flour, soy bran, honey, tapioca starch, baking powder, baking soda, salt, sugar. Gluten Free. Wheat Free. Lactose Free.